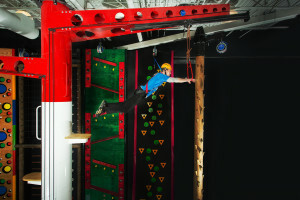 Challenge yourself, challenge your friends and don’t forget: climbing is totally fun at Clip ‘n Climb Laval. The climbing sessions are 1 hour and 15 minutes long and start every hour on the hour (don’t hesitate to contact us for more information on our opening hours). Climbers must arrive 10-15 minutes before their scheduled session. They will then receive the safety briefing and instructions on how to put on their harness and a verification of their equipment is done just before entering the climbing room for 1 hour of sensational climbing! Since all climbing wall are equipped with automated belay devices, climbers are autonomous and the number of participants is limited so we can offer you a wait-free climbing experience : choose a wall, clip your harness to the cable, climb up, and come back down slowly before going to the next wall! Once tied with the snap hook, the system allows individuals weighing between 10 and 150 kilos to gently descend to the ground. It is recommended that you wear casual and comfortable clothes as well as closed-toe shoes (sandals and boots are not appropriate for climbing)). We supply the safety equipment (harness and belay system) and it is not permitted to use personal equipment. The walls are designed to be used without chalk or climbing shoes (which are forbidden). Trublue is a new generation of auto belay devices developed specifically for climbing. It consists of a self-regulating magnetic breaking system designed to eliminate the need for gear systems. This equipment was engineered to meet the strictest international safety standards (ISO 17025 and European Certification (CE)). 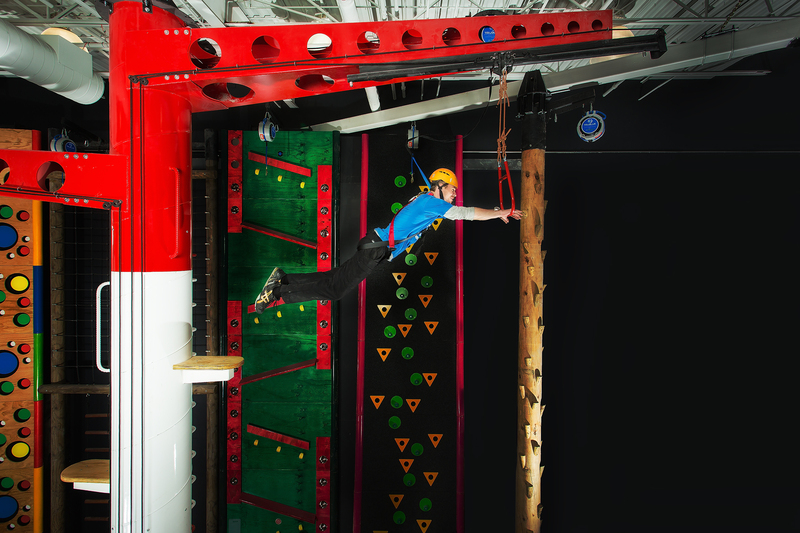 Each wall was created with different levels of difficulty so climbers can use their physical and strategic skills. The surfaces and textures vary for unique experiences. The colour and lighting of each wall make the arena an incredible playground for clients, big and small! No matter your physical abilities or your initial fears, all climbers will come out proud of their achievements! Dressed in an ultra slippery suit, try to keep your hands firmly attached to the handle that will take you to more than 10 m in height. You will then be completely suspended in the void and will only have to drop you … Will you dare go to the top?! Even if there is no minimum age to climb, we found that about half of the children 4 and under are not comfortable with the 10 kg upward tension of the automatic belay system. However, some youngsters are verb confidents and happily climb our colourful walls. 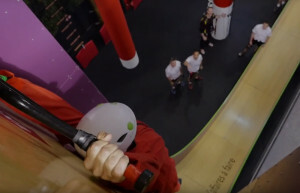 Since the distance between grips on some of the walls make them inaccessible for smaller kids, children 5 and under only pay half the price but can still enjoy the experience. A climbing session starts every hour on the hour and includes a 15 minute safety briefing followed by 60 minutes of climbing. Note: free for accompanying adults that do not climb. Please indicate the corresponding promo code when making an on-line reservation to get your partnership rebate.